The airline group’s management acknowledged Wednesday that the ongoing challenges of integrating its big Virgin America acquisition have caused “a lot of anxiety around here ... a lot of tough conversations,” and have distracted executives from other issues. Alaska Air Group management acknowledged Wednesday that the ongoing challenges of integrating its big Virgin America acquisition have caused “a lot of anxiety around here … a lot of tough conversations,” and have distracted executives from other issues as it expands routes and faces intensifying price competition. Continuing problems with canceled flights at Alaska’s regional carrier Horizon Air have added to the woes. Chief Executive Brad Tilden said the problems at Horizon have prompted him to move its flight-operations center from Portland to Seattle. Investors reacted poorly to Alaska’s financial results and the subsequent discussion between company executives and analysts, sending the airline group’s shares down more than 13 percent for the day. The airline posted a third-quarter net profit of $266 million, or $2.14 per diluted share, up only slightly from a year earlier before the company was enlarged with the addition of Virgin. This year through September, Alaska took delivery of 10 new Boeing 737-900ERs, two Airbus A321neos and 10 Embraer E175 regional jets. With the added capacity, Alaska Air is flying new routes mostly in California, while at the same time it also faces intense fare competition from larger airlines. As a result, revenue per available seat per mile flown — a closely watched measure of an airline’s efficiency — dropped to 13.12 cents from 13.97 cents a year ago, down 6.1 percent. This metric was actually flat on the legacy Alaska routes, but down on the legacy Virgin routes. Tilden said his team is studying the inherited Virgin routes closely and may reduce frequencies on some and make other changes. Rajeev Lalwani, an analyst with Morgan Stanley, said it’s logical that after initially wanting to capitalize on its expanded network in California, Alaska’s management now take a close look to see where it needs to prune. Alaska’s growth this year has been focused on California, where it’s opening 32 of its 44 new routes this year, in addition to the 40 routes it acquired with Virgin. In January, management expects to convert to a single payroll, human-resources and financial system for Virgin and Alaska Airlines, to integrate the two frequent-flyer loyalty programs, and to receive a single operating certificate from the FAA that allows harmonizing of policies — such as baggage allowances or carriage of pets — between the two aircraft fleets. Delta and Southwest are pressing Alaska in Seattle and those carriers plus American, United and JetBlue are adding fare pressure in California. Alaska Air chief commercial officer Andrew Harrison cited Los Angeles-Boston seven-day-advance fares dropping from $239 to $104, and the seven-day-advance fare from L.A. to San Francisco falling from $160 to $99. Management foresees no near-term prospect that the fare competition will ease. “We’re doing our best to work through this but we do not see any changes in this pricing environment as it stands today,” Harrison said. One financial analyst on the teleconference call — Hunter Kent Keay of Wolfe Research — criticized the handling of the acquisition, saying that operational costs are way up. “The execution has been sloppy; there’s been bad cost control,” Keay said. Tilden conceded the integration of Virgin has consumed his executive team and taken attention away from day-to-day operations and cost management. “The sooner we get this thing behind us and get back to doing what we do well, the better,” Tilden added, saying that he expects to do so by the middle of next year. “There’s a lot of anxiety around here, there’s been a lot of tough conversations in the last few weeks about this,” Pedersen said. Meanwhile, the unrelated pilot shortage that prompted hundreds of flight cancellations at Horizon Air every month this year continues. Harrison said flight cancellations and the requisite refunds or accommodating of passengers cost the airline some $25 million to $30 million in lost revenue during the quarter. But Tilden said the Horizon disruption is finally easing. “I’m confident that these adjustments will position us to run the airline smoothly as we head into 2018,” Tilden said. The flight-operations center is the key facility where staff track in real time the progress of every single aircraft in the fleet, either in the air or on the ground. 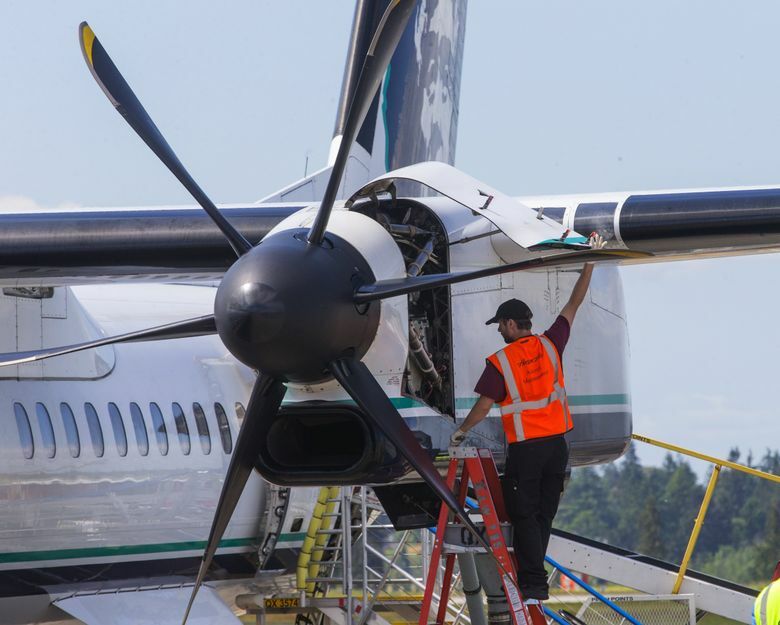 Horizon Air Chief Executive Dave Campbell, also on the conference call, said that though he’s now hiring about 30 pilots a month, “it’s going to take us another 90 days to really catch up on the backlog of training” of newly hired pilots. “It’s really now about catching up on the training,” Campbell said. In an internal message to Horizon Air employees Wednesday, also obtained by The Times, Campbell said the airline is on track to meet its 2017 hiring goal of 300 pilots and will double the size of its pilot training department. He also revealed that, excluding one-time costs, Horizon’s third-quarter profit was down 36 percent year-on-year. Even though Horizon’s fleet has grown by 10 aircraft since a year ago, following all the cancellations, total flight hours were down compared to a year ago. 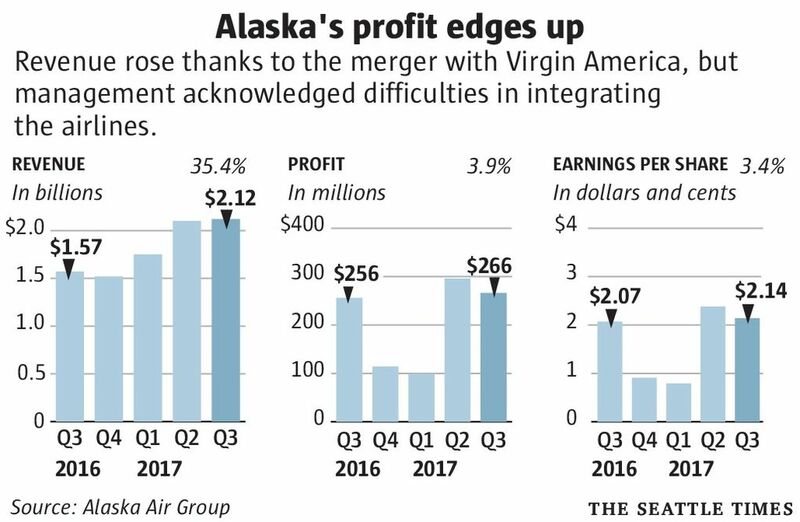 Alaska’s overall profit last quarter compares to $256 million, or $2.07 per diluted share in the third quarter of 2016, before the Virgin acquisition. Excluding the impact of merger-related costs and fuel-hedge adjustments, Alaska Air reported adjusted net income in the third quarter of $278 million, or $2.24 per diluted share, compared to $272 million, or $2.20 per diluted share, in 2016. Alaska’s costs will rise further at month-end when an arbitrator ruling should give the pilots of Alaska Airlines and Virgin America a significant pay increase. This update to the pilot contract will combine the two pilot groups, which is required because of the merger. In what Morgan Stanley’s Lalwani called an “extreme reaction” to the earnings results, Alaska’s shares closed Wednesday down $10.47, or 13.2 percent, at $68.92 per share. Information in this article, originally published October 25, 2017, was corrected October 28, 2017. A previous version of this story incorrectly described the labor contract covering Alaska Airlines pilots. The contract due to emerge from arbitration at the end of October will run through April 2020.